The inauguration comes just ten months after we signed a power purchase agreement with Eneco, which commits us to buying the entire output of the windfarm for the next ten years. It ensures that our new data centre will be powered 100% by locally generated, renewable energy from day one of operation, scheduled for the first half of 2016. The Dutch agreement is one of four such power purchase agreements (PPA) that we have signed in Europe. Three are in Northern Sweden, where we’ve bought enough wind power to ensure that our data centre in Hamina, Finland runs 100% on renewables. The most recent of these deals was signed in March 2015, buying the output of a new windfarm located at Maevaara, whose construction was financed by Allianz Capital. We continue to look for more opportunities in this space because we believe that power purchase agreements make great sense for our business and our commitment to being a carbon neutral company. Long-term purchasing gives us energy price stability. Purchasing wind power guarantees a long term source of clean energy for our data centres. And purchasing only from new renewable energy generation facilities increases the amount of renewable energy available in the grid, which is great for the environment too. This week, our infrastructure and energy team visited Delfzijl, a blustery coastal town in the far north of the Netherlands. 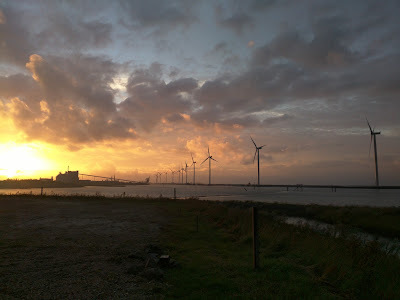 They were there to inaugurate a brand new windfarm built by Dutch power utility Eneco, which will provide renewable energy for the new 600m euro data centre that we’re building just 30 kilometers away at the Eemshaven.